For decades, many parents have considered inflatable arm bands an adequate flotation device for young children swimming at pools, beaches or lakes, but in fact, proper water wings safety habits strictly discourage this misconception. By understanding what these popular floats can and cannot do, parents and caregivers can practice better swimming safety to protect novice swimmers. 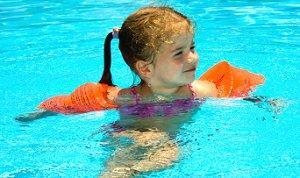 Water wings go by many names - floaties, arm bands, swimmies, side wings, etc. - but they all have similar design construction. They are inflatable plastic bands worn around the upper arm that provide mild flotation assistance for uncertain young swimmers. It is important to note that water wings are not a lifesaving device and should not be worn as a substitute for a life jacket; instead, using water wings safety equipment can help encourage novice swimmers to enjoy the water with less fear of going under because the arm bands, when worn properly, help provide extra floatation to the head and shoulders. While it may be tempting to purchase discounted water wings at the end of the summer when many retailers are liquidating seasonal inventories, this can result in purchasing wings that are too small to be effective. Always verify size, age and weight limitations on the packages to be sure children are using the proper equipment. Despite the ease of using water wings, life jackets and other safety equipment, hundreds of children drown each year or suffer near-drowning incidents that can lead to brain damage or other injuries. Water wings by themselves are not adequate to keep children safe; instead, use a variety of water safety procedures to minimize swimming risks. Always use proper safety equipment while swimming, including certified life jackets. Supervise children carefully while they are in or near the water. For home pools, consider installing a swimming pool safety fence or cover for added security. Enroll children in water safety and swimming lessons as soon as possible. Many recreation centers even offer lessons for toddlers or infants. Enforce water safety rules including proper use of safety equipment, no horseplay and other safe behaviors. While water wings safety features can help prevent accidents or injuries while swimming, parents and caregivers should be aware that water wings are not adequate as a sole means of flotation for young swimmers. By understanding what safety features water wings do have and what other precautions are necessary, it is possible to enjoy a safe, fun time at the pool, beach, or lake without exaggerated risks of injuries or accidents.